The Branham Tabernacle is one of the most beautiful churches in the land. That might be hard to understand at first glance, for there are no towering spires, no stained glassed windows, and no manicured grounds. Inside, you will not find a great choir or robed clergy. So what makes it special? Even though there is nothing in the outward appearance that hints of the World-shaking events which have transpired within it's red brick facade, this modest little church building played an important part in the ministry of a Prophet that was sent by God to capture the attention and the hearts of the Bride of Jesus Christ around the world. Since it's construction in 1933, the Tabernacle has undergone several remodelings, and in a major expansion made in 1963, 150 seats were added to the sanctuary. But the same bell the rang out every Sunday morning 55 years ago, calling the Believers to service, is still faithfully rung today in Jeffersonville. The Church that was built on a "Lily Pond", at the corner of 8th. and Penn Streets, remains today as a sheep pen for God's sheep. "About thirty years ago in a muddy pond bed, I dedicated this piece of ground to Jesus Christ when it was nothing but a mud bed. This was all a Pond. That's the reason the street's out of cater there, because the road had to go around to get away from the pond that was here. And in here, there used to be lilies, pond lilies coming up. The lily is a very strange flower. It is born in mud, and it has to press it's way through the mud and then through the waters and slime to get itself up to the top to shows it's beauty. I think that's a whole lot what's happened here. Since that time, a little pond lily has pushed itself, and when it got to the top of the water, it spread it's wings forth, it's little petals went out, and it reflected the Lily of the Valley." In 1933, Jeffersonville, Indiana, was, like the rest of the nation, in the grips of the Great Depression. Brother Billy was holding Sunday services in a rented hall, and many in his congregation were out of work. For this small, poor group of people, attempting to build a church on their own appeared as an act of folly to most of the townspeople. But the Lord had already shown this young Pastor the corner property he was to build on. 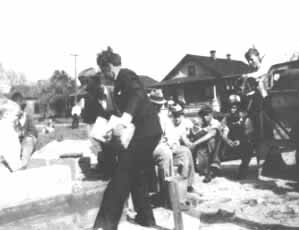 A building fund was started, and in March the congregation gathered to watch as Brother Billy placed the Cornerstone of the concrete block building. On this special day, he and his wife-to-be, Hope, and special friend, George DeArk and his wife, posed for a photo, then everyone gathered for a group picture. It was a tremenduous day for Brother Billy. 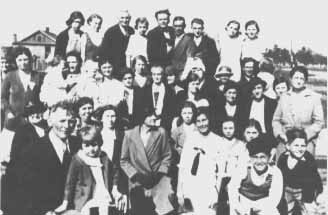 It had begun early in the morning when the Lord, by vision, had given him a little insight into his future ministry and now he had laid the cornerstone of the build from which that ministry would spread around the world - It was March 1933. Construction of the little Tabernacle was not completed until September, at a total cost of $2000. The congregation had 20 years to pay off the mortgage. In 1933, in the middle of a Depression, $2000 was a lot of money, even for a church congregation. But the Lord was with them. In the early 1940's, a new concrete floor was poured over the hard-packed dirt on which the wooden pews sat. One of the duties of the church janitor was to start a coal fire in the big pot-bellied stove which stood midway in the building, against the South wall. The outside of the building was whitewashed to cover the watermarks left by the devastating flood of 1937, during which the pulpit and the pews had floated to the ceiling. Throughout the 1930's and into the mid 1940's, Brother Billy still retained his job with the Indiana Public Service, walking a route which some days covered twenty-five miles or more. Often he was away from home for 3 or 4 days at a time. Midweek services were sometimes conducted by his assistant, but his concern for the welfare of his congregation was always evident. On a postcard, sent to his wife from one of the stops along his route, he wrote: "Dear Wife, My cold is not much better this morning. I am leaving for Scottsburg now. Tell Curtis to conduct the service Wednesday night exactly the way I told him. Love, Billy." 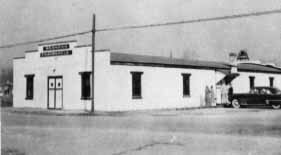 In May 1946 something happened in Brother Billy's life that would affect Branham Tabernacle, Brother Billy himself and the world - things would never be the same for this little Tabernacle at the corner of Eighth and Penn Streets. At this time, An Angel from the Presence of God appeared to Brother Billy with a Commission that would shake the entire Evangelical world. This Tabernacle would witness a Ministry unheard of since the days of Our Lord Jesus Himself. During the late 1940's the visitors started their journey towards this little white building. For the local congregation it would never be 'like it used to be' - just them and Brother Billy. Now, they would have to share the blessings of this Ministry with thousands of others. By 1950 the Name of this young preacher from Jeffersonville was known wouldwide. Word of the Miracles which followed His healing Ministry spread througout the Christian world. The story of the 'Sign in his hand' and the 'discerning of the thoughts and intents of the heart' was told over and over again, inspiring a generation to believe that "Jesus Christ was indeed the same yesterday, today, and forever." What was to be a FINAL REVIVAL FOR THE NATION was now underway. The Tabernacle received a constant stream of visitors. Many who came could not afford lodging, and so they slept in their cars in the parking lot, or even on the pews in the Sanctuary, while they waited for an opportunity to see the man who they knew was sent from God. Anxiously they waited, hoping to see the "Mesaiah Sign" (John 4:15-25); hoping to receive a touch from God for themselves, or for a loved one. 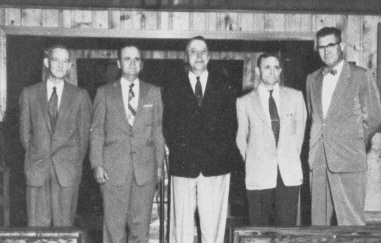 In 1954 Brother Orman Neville became the Assistant Pastor of the Tabernacle. Secretary Roda Cox handled the massive amounts of mail and requests for anointed prayer cloths (Acts 19:11-12). Bro. Dietzman and Bro. Freeman served as Deacons during this time. In 1956, the crowds gathered in this Taberacle, heard the Prophet of God announce that America had sinned away it's day of Grace. He screamed out that America had crossed the line between Mercy and Judgment. The half has never yet been told of all that God has done in the little white church on the corner. 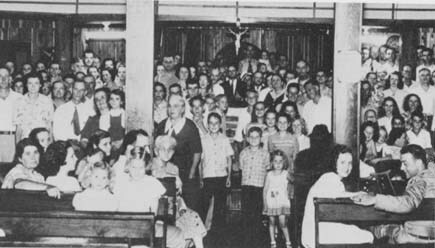 Towards the end of the decade, the simple wooden pews were replaced with padded seats, and an organ was purchased and placed on the opposite side of the platform from the upright piano that Sister Gertie played. 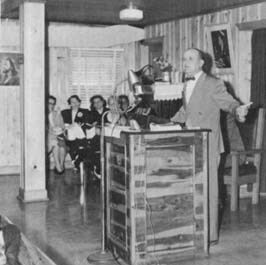 Large fans were set on the platform in the summer months, but they were not able to provide much relief for the overflow crowds that packed the building when Brother Branham returned from the Evangelistic field to speak at this little Lily Pond church. 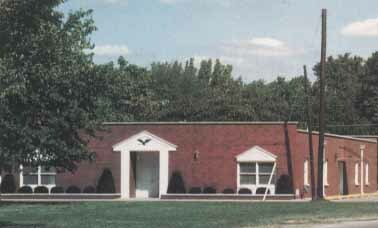 Into the 1960's the Branham Tabernacle remained the focal point in what God was doing in these last days. It was here that Brother Billy preached a series of Messages on The Seven Church Ages in 1960-61. At the conclusion of the series, the Pillar of Fire came into the Tabernacle and drew the outline of the Ages on the wall exactly as the Prophet had drawn it on the blackboard. In 1961, once again a building fund was started, and in 1963 the North wall of the Tabernacle was extended out thirty feet. The outside blocks were resurfaced in red brick, and inside, wood paneling replaced the light blue painted, particle board walls. The cedar over the pulpit was left intact, but was hidden from view by the new, lower ceiling. As the Ministry grew, the church grew; As the Ministry changed from one phase to another, the church also took on a change. The 1960's brought a tremenduous change in the Prophet's Ministry. In 1962 he preached a Message entitled, "The Present stage Of My Ministry." In 1963 A Cloud of Seven Angels appeared to Brother Billy and Commissioned him to return to his Tabernacle in Jeffersonville for the Opening of the Mystery of the Seven Seals. It was the crowning of the Prophet's Ministry and to the thousands of Believers who would recognize that ministry, the Lily Pond Church in Jeffersonville, Indiana, would become a landmark - even a Memorial of what God has done in this last Age. "Now, be kind to one another, be kind to everybody. Treat your neighbor right. Keep yourself unspotted until Jesus comes." Usually, at the close of his services in the Tabernacle, he would lead the congregation in singing, "Take The Name Of Jesus With You." But on this night he sang, "Till we meet, till we meet, God be with you till we meet again." T he Tabernacle would never be the same again. The crowds would still gather from time to time for special occasions but it would never be like it use to be. But his Messages, recorded in the Tabernacle and around the world, would continue to call the Bride to Christ and pronounce judgement upon an unrepentant world. Return To 'Laying The Cornerstone' Return to 'Believers International'.